photo above: The artwork for the T-368 as shown in TM-11-809-10. T-368 History - By the early 1950s, the widely-used Signal Corps transmitter, the Hallicrafters BC-610, was rapidly becoming outdated and a modern replacement was needed. 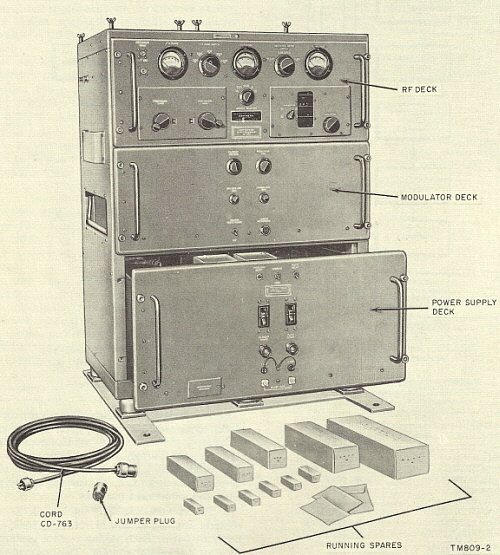 The T-368 transmitter was designed to be an updated replacement that would fulfill the military's need for a medium power, continuous-duty transmitter that could be set up for mobile operation from a truck or a portable/mobile communications hut or installed in a building for stationary operation. The design allowed for 400 watts to 450 watts of RF power to be delivered to a various types of wire antennae or to a variety of mobile whip antennae. Several different contractors built T-368 transmitters throughout its production history. While Barker & Williamson (B&W) built some of the first contracts, other companies that had contracts for T-368 transmitters included Stromberg-Carlson, TRW and Bendix. There were seven "official" T-368 versions produced with minor differences that required different letter suffixes for identification. Generally, each successive letter suffix indicates upgrades to components or circuits that were significant enough to warrant identification of that transmitter "build" as a different version. Besides the "Basic" or non-lettered version, there are lettered versions from A through F. The F-version used ceramic vacuum variable capacitors and SS rectifiers. The letter suffix is placed after "368" (e.g., T-368A/URT.) About 100 T-368 transmitters were converted to SSB by the military and these transmitters use different upper decks and a different final amplifier tube. 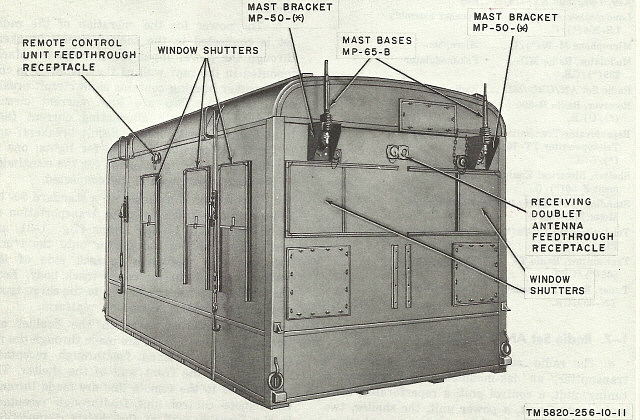 These SSB versions were later produced and designated as the T-2368. The T-368 was in service from the early-1950s up into the mid-1970s. Since the primary use by the Army was as a RTTY transmitter, the fact that AM was rapidly being replaced by SSB voice transmissions didn't impact the T-368 very much. 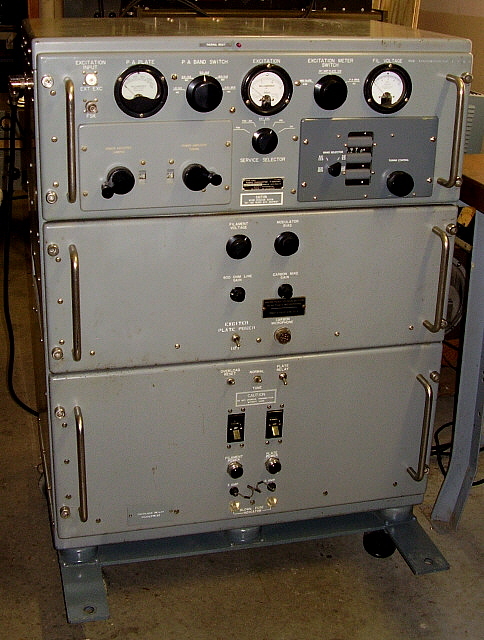 The following section illustrates how the T-368 was used for RTTY communications. Many (probably most) T-368s were used for RTTY communications and were installed in "huts" that were somewhat portable. The huts could be set-up in the field and powered by a trailer-mounted (portable,) gas-driven AC generator. The complete hut and its equipment were designated as AN/GRC-26. These huts were RTTY stations set-up for diversity reception of the incoming RTTY signals and featured two R-390 receivers running with the CV-116 Diversity RTTY Converter. The B&W artwork shown below left is of the AN/GRC-26D inside rear wall. The rack equipment (top to bottom) consists of the CV-116 Diversity RTTY Converter, R-390/URR receiver #1, R-390/URR receiver #2 and the LS-206 rack mount dual speaker. The TTY machines were TT-98 for receive only. The TT-76 was a reperforator-transmitter TTY machine for sending. The AN/GRC-26 also was equipped with the MD-239-GR which was the FSK transmitter modulator. 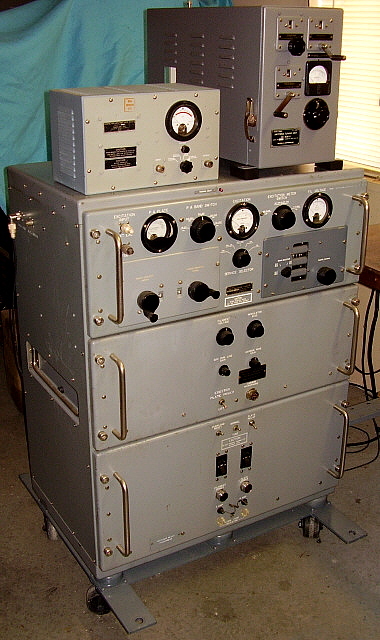 The MD-239 was usually mounted on top of the T-368 next to the BC-939-B Antenna Tuner. The C-1123 was the control set that routed incoming signals from the CV-116 to the TTY machines. It also selected the proper equipment for transmitting the various modes. The hut was approximately seven feet wide by twelve feet long by about eight feet tall. It was usually mounted on a trailer and towed to field locations. Although RTTY was the primary mode of communications, AM could be used, although usually only in an emergency. Sometimes CW was used to establish communication and then the mode was quickly changed to RTTY. 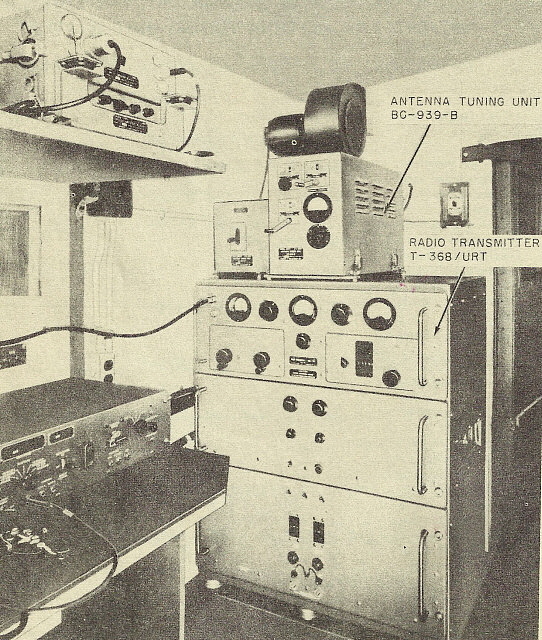 The GRC-26/T-368 set ups utilized the BC-939-B Antenna Tuner (TN-339/GR) which was essentially a gray-painted version of the tuner that was used with the BC-610 transmitter. The BC-939-B allowed the user to match either a whip antenna or perhaps a "long wire" antenna to the T-368's output. photo above: Mobile Communications Hut part of GRC-26. Front side shows the two whips for diversity receive. The transmitting whip antenna is located on the back side of the hut. 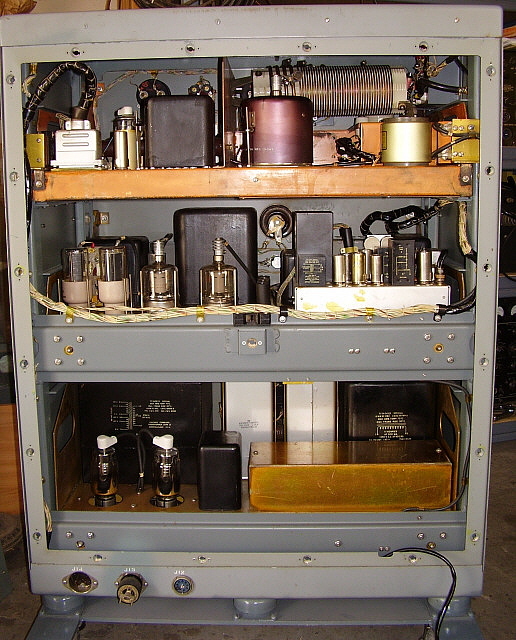 The GRC-26 also included the ME-165G SWR Bridge, Dummy Load and Watt Meter that was installed on the wall of the hut near the transmitter. This device allowed the user to measure Standing Wave Ratio (SWR) while trying to match various antenna loads. Additionally, the user could place a 50 ohm dummy load on the transmitter output. The ME-165G was rated at 200 watts continuous or up to 600 watts intermittent. A variety of antennae could be utilized. Three verticals and two dipole antennas were included in the auxiliary equipment. Also, 1000 feet of wire was included for building other wire antennae as needed. Various suffix designations identify differences in the GRC-26 communications capabilities. Most differences were minor and didn't affect over-all operation although the "D" suffix was set-up for crypto operations. Generally, AM voice or CW modes were only used for emergency and all communication was supposed to be by RTTY. However, as mentioned, it was common practice to establish communication using CW and then switch to RTTY. Circuit Details - The T-368 uses a modular unit called the Exciter that consists of a PTO (permeability-tuned oscillator,) a permeability-tuned Frequency Multiplier section and a permeability-tuned RF Output Section. A mechanical-digital Veeder-Root frequency readout is an integral part of the Multiplier/Exciter unit. The Exciter RF output tube is a type-6000 which provides sufficient power to drive the RF PA output tube which is a 4-400A. The output network is a Pi-L using Jennings vacuum variable capacitors for tuning and loading. The Speech Amplifier is module that is mounted on the Modulator chassis. The Speech Amplifier provides a dual input for either a Carbon mike or for a 600Z ohm audio line. The output of the Speech Amplifier is sufficient to drive the Modulator tubes, a pair of 4-125s. The power supply provides all of the required voltages and uses 3B28 rectifiers for the +HV and 5R4GWB rectifiers for the +LV. The cabinet contains the wiring harness and the Antenna Relay module along with the cabinet blower. There is also a smaller cooling fan for the 4-400 PA tube. The T-368 will transmit in AM voice, CW or FSK modes. It can also be used as an RF amplifier using an external low power exciter via the External Input. The transmitter is powered by 115vac at 20A, or around 2200 watts (peak) in the AM mode. For FSK RTTY operation, a proper FSK driver is necessary (MD-239/GR) and is connected to the FSK input on the front panel. Voice generally required the use of the M-29 (or similar) carbon microphone connected to the CARBON MIC input but this isn't the only way to voice modulate the transmitter. You can also run audio into the 600 OHM input via the rear Remote Input connector. Though intended for use with telephone line inputs, the 600 OHM input is almost exactly the same electronically as the CARBON MIC input with the exception that 600 OHM 1st Audio Amp has slightly higher gain than the CARBON MIC 1st Audio Amp circuit and there is no bias voltage or coupling capacitor in the input circuit. The disadvantage to using the 600 OHM input is that the mike cable must be routed to the back of the transmitter. Push-to-Talk is also available at the Remote Input. By using the 600 OHM input, a crystal or dynamic mike can be used although you will have to provide some sort of impedance matching. Usually the Astatic TUG-8 "amplified" stand will work fine into a 600Z ohm input with a variety of Astatic mike heads available. The BC-939 Antenna Tuner uses three roller inductors and two fixed-value vacuum capacitors to create three types of L or LC combinations for loading either a 15 foot to 20 foot vertical whip antenna or an ambiguously described (and never used) long wire antenna. The ME-165-G is a combination SWR bridge and watt meter/dummy load. The dummy load is rated for 200 watt continuous and up to 600 watts intermittently. The connections are via N-type coax receptacles. 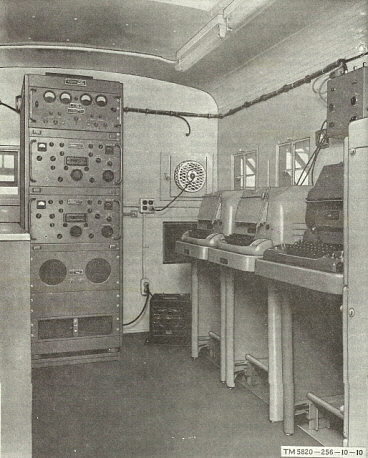 The normal location for the ME-165-G was mounted to the wall of the communications hut and to the left of the T-368. However, it can also be located on top of the T-368, as shown in the photo to the left. photo left: 1952 Barker & Williamson T-368/URT "Basic" Serial Number 29, Order No. 3472-PHILA-52. On top of the transmitter, the BC-939-A tuner and ME-165-G SWR Bridge/Watt Meter/Dummy Load. T-368 Installation Considerations - The T-368 is heavy, weighing-in at around 650 lbs. It's physically large at around 30"W x 40"T x 24"D. Generally, the T-368 will be found mounted on the military base plate which may have large heavy-duty casters installed. If casters are installed it allows for easy "rolling" moving of the transmitter once it is within the room where it is going to be used. The rear cabinet blower in the T-368 is fairly noisy in a small room. In larger rooms, where the back of the T-3 is not close to a wall, the blower noise is minimal. There should be at least two feet of clearance behind the T-3 installation to allow for cooling of the 4-400 final. There is a large air filter on the back panel for the main cooling blower. To remove any of the three decks is arduous work due to their weight (the PS section alone weighs well-over 200 lbs!) The T-368 usually requires two men to disassemble or reassemble due to the massive size and weight of the component parts. However, this "heavy-duty" approach makes the T-368 nearly "bullet-proof." It was designed for continuous operation and is generally only "coasting" in amateur service. Extensive modifications to the audio chain aren't necessary for excellent "ham-quality" AM. Most hams disconnect the carbon mike bias wire and insulate its end. Then the mike input wire is moved to the opposite end of the coupling capacitor and soldered. That's all that's necessary to use a dynamic or crystal mike at the CARBON MICROPHONE connector. On later T-368 transmitters, the crystal or dynamic mike can be impedance matched and then run into the 600 OHM LINE connector at the rear of the transmitter. T-368 transmitter shouldn't be extensively modified from its basic design as a military "communication" transmitter. Modifications installed to make the T-368 sound like an AM Broadcast transmitter will defeat the original design intent and go against the whole idea of collecting, restoring and operating vintage military radio transmitters in the first place. MWOs - Military Work Orders - MWOs are modifications installed by the military when various types of equipment went in for repair. Many of the MWOs were updates from the original contactor or design company while others were strictly military in origin. Many MWOs will upgrade older contract equipment to a later contact version. The T-368 Basic SN:29 shown to the right has had several MWOs installed. One was a newer Speech Amplifier module installed. There is a PTT mod. Level "F" version dual plate chokes in the RF deck were installed. The Plate Meter mounting is insulated as per later versions. The EXCITER PLATE POWER switch nomenclature is stenciled which was probably either a depot repair or an MWO. The Exciter has been replaced in the past (paint doesn't match.) I do have what may be the original Exciter for this T-368 (paint does match) but it was "hamster" modified with non-original and unnecessary controls (drilled holes.) The cabinet was repainted while in the depot as the antenna nomenclature is stenciled. photo above: T-368 Basic Version - B&W - 1952 contract, sn:29. This transmitter was returned to almost stock in 2014. The interlocks were put back to functional. SS rectifiers were replaced with vacuum tube rectifiers. Repairs to the wiring harness were necessary. The only modification now installed is the removal of the carbon microphone bias to allow a crystal or dynamic mike to be used at the front panel connector. The Different Versions of the T-368 - As mentioned above, there are seven "official" versions of the T-368, from the "non-lettered" or Basic T-368 up to the latest "F suffix" version. Here are the differences in the versions up to the "C suffix" from TM11-809-10. Basic - Dual Primary plate xmfr with 5700-volt 475mA secondary, Dual electro-mechanical Antenna Relays, V104 protection not used, Single 5R4GWB used for exciter ps rectifier, 250mA T-3, 3A T-4, S-12 is marked "TUNE-OPERATE," S-6 marked "EXCITER PLATE POWER-OFF," Exciter turned on with S-6 and K-6, Blower cap is 2.75uf, Keying Circuit not used. Suffix A - Dual Primary plate xmfr with 6350-volt 500mA secondary, vacuum tube delay on Antenna Relay with V-20 and V-21 added, V-104 protection added with V-23 and K-10, dual 5R4GWB used for exciter ps rectifier designated V-4 and V-22, 300mA T-3, 6A T-4, S-12 marked "TUNE-NORMAL," S-6 marked "KEYING - NORMAL/CONTINUOUS," Exciter B+ turned on with FILAMENT POWER switch, Blower cap 2.75uf, Keying circuit used V-20. Suffix B - Single Primary plate xmfr with 6160-volt 500mA secondary, vacuum tube delay on Antenna Relay V-21 and V22 used, V-104 protection same as A, exciter rectifier designation of tubes changed to V-4 and V-20, 300mA T-3, 4A T-4, S-12 marked "TUNE-OPERATE," S-6 marked same as A, exciter B+ same as A, increased blower size with 4uf cap, Keying circuit designation of V-20 changed to V-21. Suffix C - Single Primary plate xmfr with 6336-volt 500mA secondary, Antenna Relay same as B, V-104 protection same as A, exciter ps rectifer same a B, 300mA T-3, 4A T-4, S-12 marked "TUNE-NORMAL," S-6 marked same as A, exciter B+ same as A, Keying circuit same as B. As can be seen, most of the changes are minor with increased ratings of some of the transformers being the most prominent. Some were circuit additions, such as the keying circuit addition from version A on. Changes in switch nomenclature and component designations were required as circuits were modified or other circuits added. Certainly, as the T-368 evolved with more an more varied uses by the military, changes in component ratings needed to change as the circuit was "fine tuned" for all military applications. Are the Later T-368s Better? - Probably. The later versions will have all of the upgrades and improvements already installed as original equipment. The earliest version, the Basic, doesn't have the keying circuit but it was installed on many Basic transmitters as an MWO. Later versions have heavier duty iron. This usually isn't changed on earlier versions unless there was a depot repair involved. The Plate Current meter on early versions isn't well-insulated from the chassis and it is actually in the "plate circuit" at full B+. Many Plate Meters were changed with MWOs to prevent arcing problems. Essentially, with early versions of the T-368, if the upgrades are installed, the work was performed as individual MWOs. This doesn't necessarily mean that early versions should be avoided. Check the MWOs. Earlier versions are usually less expensive and quite often many of the upgrades are installed. Later versions generally command the higher prices because you are assured that the upgrades are (should be) present. Buying a "T-3" - Unless the prospective purchase is for an incomplete, "needs rebuilding" type of transmitter, the price is going to be high. T-3s are in demand today and are priced accordingly. On a fully operational transmitter it's usually easy to get a demonstration or to arrange an "on the air" schedule so you can hear how it sounds. These types of purchases are usually problem-free. It's the non-operational transmitters that present something of a problem unless you've seen a few T-3s or have studied the manual a bit. Any T-3 that is missing any of the three decks should be considered a "parts set." If the modulator deck or power supply deck are missing transformers or chokes then consider the transmitter "for parts only." Some minor parts are pretty easy to locate as are most of the tubes. The type 6000 tube in exciter can be expensive but can usually be easily found. The 4-400A and the 4-125A tubes are expensive but easy to find. However, you should be cautious of a T-368 that's missing tubes. It means that at sometime in the past the transmitter was considered a "parts donor." >>> >>> T-3s that are complete but haven't been in operation for a considerable period of time are ideal to find. They usually aren't as "high priced" as fully operational transmitters. With a thorough checkout these untested types of T-3s usually will operate fine. Most of the time you will have to find a minor part or two. This is to be expected - it's major components that are hard to find. It's not impossible to checkout the "iron" before a purchase but the power supply deck and the modulator deck will have to be partially pulled out to access the components. For the most part, transformers and chokes are "bullet-proof." In fact, all of the parts on the T-3 are robust but some transmitters were abused so you never know the condition unless you pre-test. Shipping - This is difficult to accomplish but not impossible. The T-3 has to be put on a pallet and strapped down. Then the entire transmitter is wrapped in something to protect it - usually plastic wrap. Shipping is done by freight truck which is expensive. Pick up is a much better option but requires that the transmitter be close by. Even then, at least two strong people are necessary to disassemble the transmitter for moving. Each deck should be removed and loaded followed by loading the cabinet. In this manner, two strong individuals can handle a T-3. Reassembly - Upon getting a T-3 home, you should do your work in the area where you're going to use the transmitter, if possible. Otherwise, you'll probably have to disassemble again to move it to it's permanent location. Most T-3s will have the shock mount still installed and these sometimes have heavy-duty casters installed for easy moving. Be sure to thoroughly inspect all three decks for any obvious problems. Test all relays, test all tubes, test all transformers and chokes, inspect all cables and connectors. A thorough inspection now will save you a lot of troubleshooting later. The following are more thorough details on various inspections that are necessary. Speech Amplifier - There are two separate audio input circuits in the speech amp. One amplifier is for a Carbon Microphone input and the other amplifier is for the 600 Z ohm audio input. Each input has an associated 25K potentiometer gain control that is exterior to the actual Speech Amplifier chassis (mounted on the front panel of the Modulator deck.) Each pot will adjust the input level to the grids of each input speech amplifier tube. The amplifier circuit gains are different with the 600 Z ohm amplifier having somewhat more gain than the Carbon Microphone amplifier. Small coaxial cables route the audio inputs (which includes the 25K gain pots) to BNC connectors on the Speech Amp chassis. Four stages of audio amplification are used and two "potted" filters are in the circuit to shape the audio bandwidth to 300hz @ 1db down on the low side and 3500hz @ 1db down on the high side. The output stage uses a 6C4 tube driving a P-P output transformer which is routed via shielded cabling to the input grids of the 4-125 modulator tubes. The are some variations in some of the Speech Amplifier modules. Early versions use RF choke coupling to the grids of the first audio amplifiers while later versions eliminate the chokes entirely and some very late versions use 10K resistors to couple to the grids. Component placement is critical in the Speech Amplifiers that have the RF choke inputs since the 1st Audio Amplifier tube's heater decoupling capacitors are very close to the RF chokes and can couple heater voltage (6.3vac) hum into the grids of the 1st Audio Amplifiers. Make sure there is ample separation between the decoupling caps and the RF chokes. photo right: The Speech Amplifier Module. The pots adjust the Clipper circuit. Remote Input - This input is located on the rear bottom apron of the transmitter. It provides input access for the 600 Z ohm input, CW, Carbon Mike input, PTT line, Break-in for the receiver and remote actuation of the Plate Relay (necessary for changing from CW to AM modes when needed.) Using the 600 Z Ohm input will require a long cable that has one shielded audio cable for the audio input. The other wires in the cable don't require shielding although it would be a good idea to have the entire cable shielded just to protect the other lines from RF pickup. It's common to run the shielded audio cable plus a PTT line and two lines for receiver Break-in. One can make the cable with appropriate length wires and shielded audio cable. The entire cable can be shielded with braid removed from RG-8 cable. Cover the finished cable with a couple wraps of electrical tape. At the mike-end a metal box can be installed that has appropriate connectors for PTT mike function. Using this arrangement can allow CW operation by connecting the key to the U-77 connector on the front of the modulator deck (even though it's marked CARBON MICROPHONE.) CW "keys" the PTT line which is accessed at the CARBON MICROPHONE connector. You can also run a carbon mike if you want to - for authenticity (this would probably only be appreciated on vintage military radio nets.) Ground Loops in the 600Z Ohm Line - Early T-368 transmitters will have differences in how the shielded lines are grounded as they are routed from the Modulator deck through the harness connector and through the harness down to the Remote Output. Early transmitters have every shield input and output grounded which sounds like a good idea. However, sometimes chassis currents can interfere with the grounding and cause buzzing or hum to appear on the shield. This couples to the 600Z ohm line causing hum problems. The later transmitters will use shielded cables with an insulated jacket to prevent accidental grounding of the shield as it is routed through the transmitter. Additionally, only certain parts of the shield are actually grounded. This then eliminated the possibility of ground loop hum. Unfortunately, unless the earlier transmitter has been reworked with an MWO to correct the grounding, this may have to be done before you can use the 600Z ohm line input. Follow the later schematic exactly for where the shield is grounded and where it isn't. Carbon Microphone Input and CW Key Input - The U-77 box connector on the front of the Modulator deck provides input for either a Carbon Microphone or Telegraph Key. The bias level provided is rather high and not adjustable. Some types of carbon mikes could be damaged by this high level (+13vdc) of bias. The carbon mike designated is the M-29 "Porkchop" which features an easily replaced, plug-in element. The CW key works from pin F to pin E which is keying the PTT line for CW. It's interesting that some of the original T-368 military RTTY set-ups had nothing connected to the U-77 front panel connector. This was so a hand key could be connected when needed. Many RTTY communications used CW for the ID that was sent prior to beginning RTTY operations. An Easy Way to Use a Crystal Microphone - An easy way to get around ground loop problems and associated noise or hum on the 600Zohm line is to use the Carbon Microphone Input instead. A slight change in the input circuit is required. Disconnect the wire that supplies the carbon mike bias and connect the input wire from the microphone input connector to the opposite side of the coupling condenser. This wiring now has the mike connector going directly to the 25K Carbon Mike Gain pot. You can now use an Astatic TUG-8 mike stand with a D-104 head. The 600 Ohm Line Gain pot must be kept a zero. For lowest noise, disconnect the 600 Ohm Line cable at the Speech Amp and then use a "shorted" BNC connector to apply a direct short to ground at the Speech Amp for the 600 Ohm Line input. This assures that no noise will be coming from that input. HV RF Cleanliness - Whenever the RF operating voltages are +2KV or higher, it's essential that everything be kept very clean. All ceramic switches must be clean. All tank coils must be clean with no contamination between the turns of the coils. All connections that involve feed-thru insulators or connections that use nuts (or screws and nuts) must be clean and tight. It pays to go through the RF deck's output section carefully and check all connections. You generally will find a few to several that are loose. You will usually find some dirt and contamination in various places. Anywhere that high RF voltage is present will have to be scrupulously clean and the mechanical connections tight. Relays - The T-368 uses several (in fact, many) relays. It's a good idea to check all of the contacts on all of the relays before the transmitter is put into service. Check how the relay arm's throw actually makes the contacts. Often you'll find that the contacts are barely touching. Most likely this is due to aging (or contact wear) rather than mis-adjustment. It's only necessary to slightly bend the arm to have the contacts making correctly. You can clean the contacts with 600 grit AlOx paper and then clean the residue off with alcohol and a paper towel pulled thru the contacts. Be sure to check the Antenna Relay box on early versions because there are two relays inside (later versions use a vacuum relay.) Most of the other relays are located under a box shield on the power supply chassis. Most relays can be accessed with the rear cover of the transmitter removed. Interlocks - Details - Like many medium (and all high) power transmitters, the T-368 employs several interlocks to prevent accidental contact with high voltages or to prevent unintentional damage to the transmitter by inexperienced operators. The AC input voltage interlocks use four GE heavy-duty 7760014 type dual contact door interlocks that disconnect the AC to the primaries of the +HV transformers if any of the three decks are pulled out or if the back panel is removed. Additionally, there are five spring contact interlocks that control various signal routing. There is also a microswitch that is mounted to the pi-network bandswitch that disables the +HV if the operator attempts to change bands with the transmitter plate voltage on. Sometimes a T-368 will be found where some or all of the interlocks are either bypassed with a jumper wire or entirely removed. If the interlocks are maintained in good clean condition their function doesn't hinder the proper operation of the transmitter. Additionally, they provide a safety factor since any access to the +HV inside requires some thought on how the process can be achieved and therefore prevents careless "poking around" when +2500vdc is present on many of the components. Most of the troubleshooting involves only powering the +LV sections of the transmitter which are powered up when the FIL breaker is turned on. The various interlocks sometimes make it a hassle to test various parts of the T-368 circuits while the transmitter is in operation but in most cases it isn't really necessary to bypass their function since the circuits can be troubleshot by circuit analysis. To preserve the contact surface on the interlocks don't try to pull any individual deck with the power on. To pull any deck out, the transmitter should first be turned off and unplugged from the AC line. You can't pull the decks out too far unless the plug-in connectors for that deck are unplugged. Most of the time maintenance and troubleshooting can be accomplished by only removing the back cover. It is held in place with d-zus fasteners which only require a half-turn to loosen. All tubes, most of the relays and the Speech Amp are easily accessible with the back cover removed. If power-up is necessary, only the rear cover interlock needs to be bypassed. Rear Panel Removal to Access Components - The photo right shows the T-368 Basic with the rear cover off which provides access to most of the components. All of the tubes are accessible in addition to most of the relays. The gold anodized box shield on the power supply deck (lowest deck) covers most of the relays and is held in place with two screws. 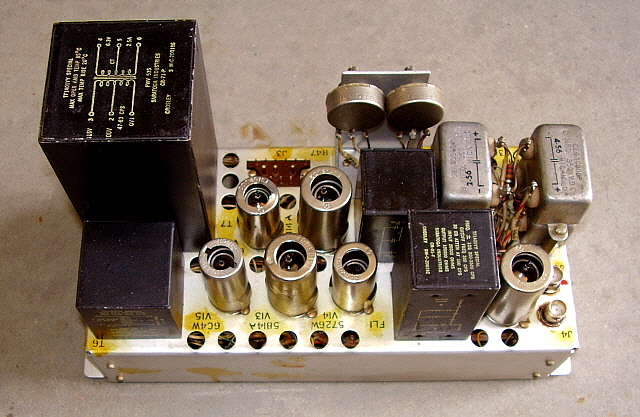 The middle deck has the Speech Amplifier to the right side, 4-125 modulator tubes in the middle and behind the 5R4GWB rectifiers is the AM/CW relay. The upper deck is the RF Amplifier and Exciter. The Exciter is not accessible from the rear but the tubes and the 4-400 fan motor are. Also, accessible from the rear is the Antenna Relay module mounted on the inside wall of the cabinet. Pull the upper deck out from the front (be sure to unplug the harness cable plug) and you can then access the Exciter and the Output Network. Nearly every part of the transmitter can be accessed by removing the rear cover or by partially pulling out (but not removing) either the RF deck or the Modulator deck.